Several neurodegenerative disorders are linked to the build-up of abnormal α-synuclein protein in distinct cell types. It emerges that differing intracellular factors dictate the properties of this protein in each cell type. Lary C. Walker is in the Department of Neurology and Yerkes National Primate Research Center, Emory University, Atlanta, Georgia 30322, USA. One of the many mysteries surrounding neurodegenerative diseases is how they can manifest in such a variety of ways. Disorders such as Alzheimer’s disease, Parkinson’s disease and amyotrophic lateral sclerosis (also known as motor neuron disease) are each defined by a core set of nervous-system abnormalities, but every affected person’s brain responds slightly differently. Moreover, although each of these disorders is associated with the abnormal accumulation of a different protein in or around cells, some protein aggregates can give rise to more than one neurodegenerative disease. How can this happen? In a paper online in Nature, Peng et al.1 present persuasive evidence that different types of cell accumulate structurally distinct forms of one protein, α-synuclein. By shaping the 3D architecture of the corrupted protein, the cell type helps to determine the nature of the resulting disease. Most normal proteins fold into characteristic conformations that are strongly governed by the protein’s amino-acid sequence. But in age-related neurodegenerative conditions, certain proteins misfold, and induce other proteins of the same type also to misfold and to stick to one another. In this way, the abnormal molecular structure propagates by means of a crystallization-like process called seeded protein aggregation2. One such protein is α-synuclein. Under normal circumstances, α-synuclein is located mainly in nerve terminals. But in some cases, the protein forms intraneuronal aggregates called Lewy bodies and Lewy neurites — for instance in Parkinson’s disease and a condition known as dementia with Lewy bodies, which are collectively referred to as Lewy body diseases (LBDs). In a more-aggressive brain disorder called multiple system atrophy (MSA), misfolded α-synuclein accumulates mostly in neuron-supporting cells called oligodendrocytes3, in clumps known as glial cytoplasmic inclusions. Why α-synuclein aggregates are mainly found in different cell types in MSA and LBDs has been uncertain. It cannot be attributed to differences in amino-acid sequence, because α-synuclein is not typically mutated in the common form of either condition4,5. However, previous work6 has shown that aberrant α-synuclein in LBDs is structurally and functionally different from that in MSA. These variant molecular states are known as protein strains7. When injected into the brains of susceptible mice, the MSA strain causes a fatal disease similar to human MSA. By contrast, injecting the LBD strain fails to induce major signs of disease in this model8. Peng et al. set out to investigate the causes behind this difference in α-synuclein potency. The authors first confirmed that protein aggregates in the oligodendrocytes of people with MSA are conformationally distinct from those in neurons from people who have LBDs. In MSA, a few neurons do harbour α-synuclein aggregates, but the researchers found that these aggregates display the LBD conformation — thus, the two strains can occupy the same brain, albeit in different cell types. Next, the team exposed cultured cells to each strain, and found that MSA-derived α-synuclein is approximately 1,000 times more potent at inducing aggregation than is the LBD-derived protein. The authors then injected the two types of aggregated α-synuclein (called seeds) into the brains of wild-type mice. This in vivo experiment confirmed that MSA-derived seeds are much more effective than seeds derived from LBDs at seeding aggregation. However, the seeds instigated aggregation only in neurons, not in oligodendrocytes. Why might this be the case? 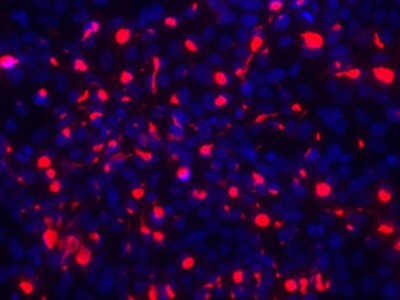 Oligodendrocytes normally produce little, if any, α-synuclein9. The authors therefore genetically engineered mice to express α-synuclein only in oligodendrocytes. They found that α-synuclein aggregation could be induced in oligodendrocytes in these mice using seeds from either the MSA or the LBD strain — but again, the MSA strain was much the more potent. Importantly, the aggregates that emerged were always the MSA strain, regardless of the type of seed injected. Finally, when Peng et al. exposed synthetic, unaggregated α-synuclein to cellular material that had been isolated from ruptured oligodendrocytes or neurons, the oligodendrocytic homogenate caused the protein to aggregate into a strain of greater seeding potency than did the neuronal homogenate. Some as yet unidentified factors in oligodendrocytes, then, seem to drive the formation of the MSA strain. Collectively, the authors’ experiments show that oligodendrocytes produce a structural variant of α-synuclein that robustly seeds aggregation in both oligodendrocytes and neurons. 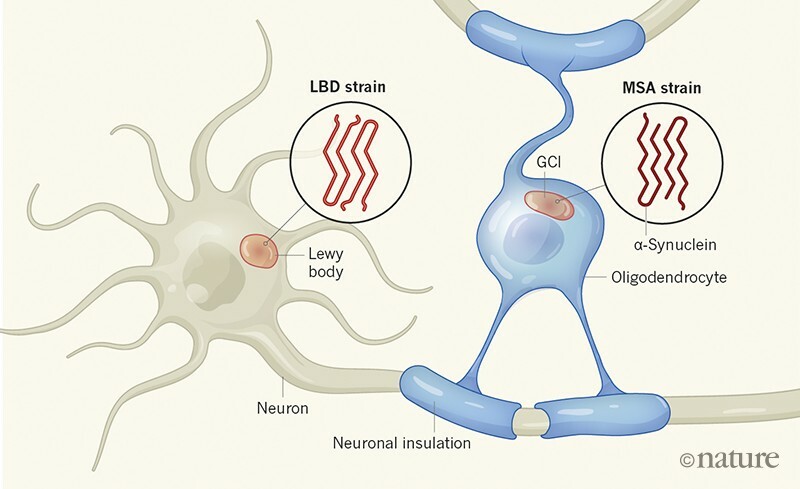 However, the cell type strongly influences the molecular strain of the aggregates that forms: oligodendrocytes specifically generate the MSA strain, whereas neurons preferentially produce the LBD strain (Fig. 1). The authors conclude that cell-type-specific factors regulate the molecular architecture and distinctive harmful properties of aberrant α-synuclein aggregates. They further suggest that the robust seeding capacity of the MSA strain contributes to the aggressive clinical progression of MSA. Figure 1 | Distinct strains of α-synuclein protein. In Parkinson’s disease and dementia with Lewy bodies (collectively referred to as Lewy body diseases; LBDs), a misfolded form of α-synuclein called the LBD strain aggregates mainly in neurons to form anomalous structures called Lewy bodies and Lewy neurites (not shown). But in a disease known as multiple system atrophy (MSA), a different strain of misfolded α-synuclein forms aggregates called glial cytoplasmic inclusions (GCIs) in oligodendrocytes — non-neuronal cells that normally produce the fatty insulation for neuronal projections. Peng et al.1 show that differences in the intracellular environments of the two cell types are responsible for the formation of the two strains. The recognition that different cells generate different disease-causing protein strains raises a wealth of questions. An especially perplexing problem is how such large amounts of α-synuclein end up in oligodendrocytes in MSA, given that these cells do not produce much of the protein9. Possible mechanisms include augmented oligodendrocytic expression of α-synuclein in the disease state, or the uptake of α-synuclein that has been released from neurons10. MSA can affect different brain systems in people with the condition3. Peng and colleagues’ findings demonstrate the possible role of cell composition in these differences, but what other factors might be involved? Perhaps the metabolism of α-synuclein in neurons and oligodendrocytes varies between brain regions. Or maybe the regional vulnerability to α-synuclein deposition is dictated mainly by where seeding first occurs. Two other types of neuron-supporting cell, astrocytes and microglia, are also involved in MSA, but their roles in the disease remain to be defined11. Finally, the role of small, toxic α-synuclein assemblages called oligomers12, which might act in different brain regions from the larger aggregates, needs further exploration. Clarification of these issues could improve our understanding not just of α-synuclein diseases, but also of other neurodegenerative disorders that involve protein aggregation. In sum, the authors’ work highlights the interplay between a cell’s composition and proteins that can cause disease. Identification of the cell-specific factors that impel α-synuclein to aggregate into the MSA strain could reveal ways to treat this debilitating and ultimately fatal brain disorder. Peng and colleagues’ findings are also a salutary reminder of the salient part played by non-neuronal cells in both the health and failure of the nervous system. Peng, C. et al. Nature 557, 558–563 (2018). Jucker, M. & Walker, L. C. Nature 501, 45–51 (2013). Krismer, F. & Wenning, G. K. Nature Rev. Neurol. 13, 232–243 (2017). Nussbaum, R. L. Cold Spring Harb. Perspect. Med. 7, a024109 (2017). Hernandez, D. G., Reed, X. & Singleton, A. B. J. Neurochem. 139 (Suppl. 1), 59–74 (2016). Peelaerts, W. et al. Nature 522, 340–344 (2015). Walker, L. C. Annu. Rev. Genet. 50, 329–346 (2016). Prusiner, S. B. et al. Proc. Natl Acad. Sci. USA 112, E5308–E5317 (2015). Koga, S. & Dickson, D. W. J. Neurol. Neurosurg. Psychiatry 89, 175–184 (2018). Woerman, A. L. et al. Cold Spring Harb. Perspect. Med. 7, a024588 (2017). Brück, D., Wenning, G. K., Stefanova, N. & Fellner, L. Neurobiol. Dis. 85, 262–274 (2016). Bengoa-Vergniory, N., Roberts, R. F., Wade-Martins, R. & Alegre-Abarrategui, J. Acta Neuropathol. 134, 819–838 (2017).